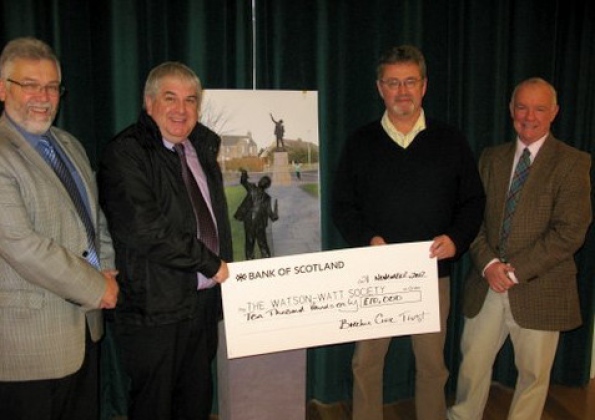 THE CITY of Brechin Civic Trust has presented a cheque for £10,000 to the Watson-Watt Society of Brechin’s campaign to erect a permanent memorial to Sir Robert Watson-Watt, the radar pioneer. Handing over the cheque, trust treasurer Gordon Watson said: “This honours a pledge we made some years ago to donate to this project. Mike emphasised, however, that, although considerable progress had been made, money was still required and he hoped the strong support of the last year would continue as “every single pound counts”. The society has reached the point whereby the sculptor, Alan Herriot, can complete the clay model of the statue and the foundry can construct the mould. The next stage would be the casting in bronze of the figure of Sir Robert Watson-Watt. An exact miniature of the statue, which will be sited in St Ninian’s Square, is currently exhibited in Brechin Town House Museum. Anyone seeking more information or would like to make a contribution can contact Mike Holland phone 01356 624053/email jennifermholland@hotmail.com or the secretary, Brian Mitchell, phone 01356 624356/email bmitch@mmitch58.wanadoo.co.uk.